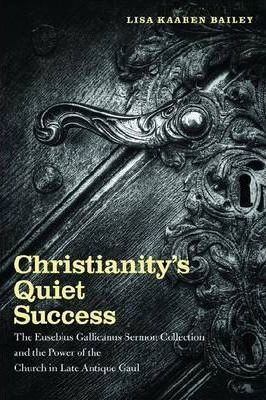 Lisa Kaaren Bailey's Christianity's Quiet Success: The Eusebius Gallicanus Sermon Collection and the Power of the Church in Late Antique Gaul is the first major study of the Eusebius Gallicanus collection of anonymous, multi-authored sermons from fifth- and sixth-century Gaul. Bailey sheds new light on these sermons, which were strikingly popular and influential from late antiquity to the High Middle Ages, as the large number of surviving manuscripts attests. They were used for centuries by clergy as a preaching guide and by monks and pious lay people as devotional reading.Bailey's analysis demonstrates the extent to which these stylistically simple and straightforward sermons emphasize consensus, harmony, and mutuality as the central values of a congregation. Preachers encouraged tolerance among their congregants and promoted a model of leadership that placed themselves at the center of the community rather than above it. These sermons make clear the delicate balancing act required of late antique and early medieval pastors as they attempted to explain the Christian faith and also maintain the clerical control considered necessary for a universal church. The Eusebius Gallicanus collection gives us fresh insight into the process by which the Catholic Church influenced the lives of Western Europeans.